Clanranald was placed unavoidably at the centre of these feuds. The clan’s hereditary interest in Canna resulted from the misappropriation of the dowry of the MacRuari lands of Garmoran by Ranald in the mid-fourteenth century. Ranald was the progenitor of Clanranald, and tutor to the four nephews who stood to benefit. By this arrangement he added an interest in one half of the lands of South Uist, and the isle of Canna for himself, to the allocation of land he had been granted of the other half of South Uist, Eigg, Rum, Morar and Arisaig. The hereditary interest of Clanranald in Canna results from this period, notwithstanding that the ownership of the island was vested in the Church, where it remained until 1627. Clanranald continued to suffer at the hands of the Macleods. In 1593 the grandsons assembled at Howmore upon the death of the eighth chief of Clanranald to discuss the succession, and were subject to a surprise raid. In the ensuing retaliatory attack on the Macleods the Clanranald heir, Iain Mor Moidartach, was slain, and his brother appointed clan chief. As the Macleods had failed to produce evidence of their title before the Lords of Exchequer, their lands were declared forfeit in 1598, but this failed to stem the feuding which engulfed the whole of the Hebrides until the Mackenzies subdued Lewis, overrunning the final bastion of Macleod defiance at Stornoway in 1613. ….. well braid on the heicht thereof, that man may scairslie climb to the heid of the craig, and quhan the cuntrie is invaded the people gadderis thar wives and geir to theheid of the craig and defend thame selfis utherwayis the best thay may….. It is significant that he made no mention of the castle having been built at that time. He also noted that the island had the capability of raising 20 men, and that it was by then in the possession of Clanranald. Contemporary descriptions of Canna give an indication of its importance – and of the fact that it was an extremely valuable asset to have in one’s possession. Clanranald’s interest in the island is confirmed by a rental agreement of 1561. Dean Monro’s account of 1549 notes the existence of the parish church, and that the island was good for ‘corn, girsing (grass pasture) and fisching’, qualities that were echoed by Skene and by the cartographer Timothy Pont toward the end of the century. Macfarlane’s account of the 1590s referred to Canna as being ‘verie profitable and fertil both of corne and milk’. Tiends bound the occupants of the island to provide corn to Iona, in whose ownership the island remained. Martin Martin informs us (1695) that sailors from the island referred to when at sea as 'Tarsin', meaning 'lying across'. An unexplained glitch in the occupation of the island at a time of change appears to have occurred in 1626 when the name of a John McLeod is mentioned, but by 1627/8 the feudal superiority passed from the Bishop of the Isles (who, in the Post-Reformation years was entrusted with the Iona’s landholdings), to the Earl of Argyll. The title implied that it was a land of plenty, in much the same terms as the early chroniclers, with mention made of houses and mills (suggesting that there could have been more than one mill). Clanranald’s right to occupy and farm Canna was confirmed by a charter granted by Argyll in 1672. As to whether the chief of Clanranald, or members of his family, ever lived on the island at this time is a matter of conjecture, but there is a reference to two brothers of the 11th chief, Ranald and John, both dying on Canna in the same year, 1636. It was the 13th chief, Donald, who is most closely associated with the island. He died on Canna, in 1686, and if he had chosen to live on the island, the conditions could have been likely to have been primitive. Donald’s exploits became the stuff of legend, and they led to the defensive tower at Coroghon being given with the title of the ‘prison’, by which name it has always been referred to by the residents of the island. Go on shore at the nearest point, and visit a lofty slender rock, that juts into the sea: on one side is a little tower, at a vast height above us, accessible by a narrow and horrible path; it seems so small as scarce to be able to contain half a dozen people. Tradition says that it was built by some jealous regulus, to confine a handsome wife in. Whatever the accuracies of the story, it was repeated at will. By the end of the century the details had already been embellished. It was immortalised in Walter Scott’s epic poem The Lord of the Isles, composed after a tour on the Lighthouse Commissioners’ yacht in 1814. By the end of the seventeenth century it had become apparent that the Small Isles were not to be spared from continuing harassment from sea raids. These had assumed a new dimension which might best be described as ‘gunboat diplomacy’. The first hint of this had come from a campaign waged on those areas showing Jacobite sympathy against the writ of William and Mary. The frigate Dartmouth set sail from Greenock in 1690 with the instructions to ‘burn the boats and birlinns’ of all sympathisers. They harried Islay, Rum, Canna and Eigg before descending on Skye. Equally Canna was not immune from the depredations that accompanied the Jacobite Rising of the ’45, and the aftermath of Culloden in the following year. 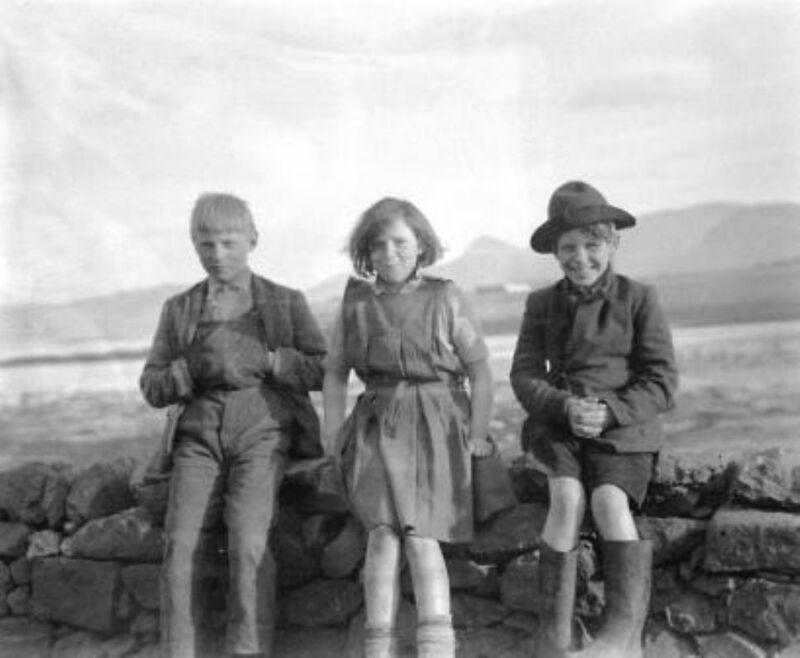 The story is told by Alexander MacDonald, or Alasdair mac Mhaighstir Alasdair, at one time Baillie of Canna who John Lorne Campbell considered ‘far the best-known personality connected with Canna historically’. He lived on Eilean a’Bhàird, the islet at the western extremity of the harbour, of which the foundation remains of the house are visible on the south west slope of the island. The involvement of the Canna men in the Rebellion is a confused story, but the strong suspicions that they had come out in support of Macdonald of Laig were sufficient for a man of war, the Baltimore, to descend on the island in April 1746, and extract revenge by destroying the possessions of the islanders. They were followed within the matter of a few weeks by the Commodore, the officers and the accompanying Hanoverian troops who were on board the vessel showed no mercy to the islanders. Alexander relayed the accounts of the atrocities to Bishop Robert Forbes for inclusion in the papers which were published eventually as The Lyon in Mourning. Alexander’s reputation was earned however, first and foremost as a Jacobite poet, with a selection of poems published in 1751 burned in Edinburgh by the public hangman for their alleged sedition. Among his most stirring compositions at around the time he was on Canna was The Birlinn of Clanranald, considered to be a poignant epitaph for the lost world of the Gaels. Pennant’s account of the island in 1772 – a fascinating mixture of fact, fiction and legend - is unusually detailed as a direct consequence of being confined to Canna harbour due to inclement weather. Nevertheless it left a lasting impression upon him, and the published account of his tour included an etching of Coroghon Castle by his accomplice, Moses Griffiths. He records the islands at a time of transition when tacksmen still lived there, just before improvements were to be instructed upon the arrival of Hector MacNeill. Pennant began with the customary account of an island covered with verdure, and with grazing black cattle (and horses) to behold the eye. He was not prepared for what he was to discover that the inhabitants were enduring great poverty, with the crops of corn and potatoes having failed in the previous year. The mills had gone, and grinding corn was now only possible with the laborious use of quern stones. With perception he noted the risks to their welfare from satisfying the ‘demands of a landlord, or the oppressions of an agent’ who would demand the right of servitude. Even the bounty of the sea was not available to them due to a shortage of fish hooks, but of this he realised that to attempt a fishery would require very considerable investment, not least to acquire costly fishing vessels of 20 tons, fishing tackle and paid crewhands. This was ‘past the ability of these poor people’. In 1764 Walker, in his Report on the Hebrides, had come to a similar conclusion, noting that ‘There are several Cod Banks within reach of the Island, but the Inhabitants never fish but to supply themselves’. A further deterrent which prevented the fishermen from curing fish were the punitive salt laws, which required fishermen to travel considerable distances across dangerous open water to a custom house, a problem noted by the parish minister in 1794. Salt duties were not eased until 1817, too late for the island fishermen to benefit as they possessed no capital for boatbuilding. Pennant also noted that the manufacture of kelp was carried out on the island. Introduced to North Uist in 1735, it became a valuable source of alkali for the bleaching, soap and glass-manufacturing industries. It was a highly labour intensive activity, and was never popular among the island populations. With unscrupulous agents or lairds there would be a strong desire to encourage the population to remain on the islands, and not emigrate, in order to gather and burn the seaweed on the shore. Children, as well as the elderly, would be engaged in this miserable task. The small tenants would no longer be encouraged to manure the land with seaware, as this would compete with kelp-burning. It had the inevitable consequence that the quality of the soil, and its ability to support crops, would suffer over time. Edward Daniel Clarke in 1797 noted that ‘The lands lie neglected, and without manure….’. The manufacture of kelp would have been a primary consideration when the first land clearance took place at the township of Coroghon at the end of the eighteenth century, when the tenants were encouraged to live on Sanday. As the value of its natural produce, by sea and land, is almost wholly absorbed by the great landowners, and by many of them spent at Edinburgh, London, Bath and elsewhere; as the people are thus left more or less at the mercy of the stewards and tacksmen, the natural resources of the country, instead of a benefit, become a serious misfortune to many improveable districts. In essence he was preparing the way for the involvement of the British Fisheries Society in Canna. At the inn, the young Chief’s health was repeatedly drank with the strongest marks of attachment to his family and person by all present…….. At six o’clock all the ladies in that part of the country assembled in the tea-rooms, and at seven the dancing commenced, which continued with great spirit (with the interval of a cold collation) till seven o’clock next morning, after spending the night with the greatest harmony, and with one voice and mutual consent agreeing to meet annually at the same place to celebrate the birth-day of the best of the Chiefs, the birth-day of Clanrannald.